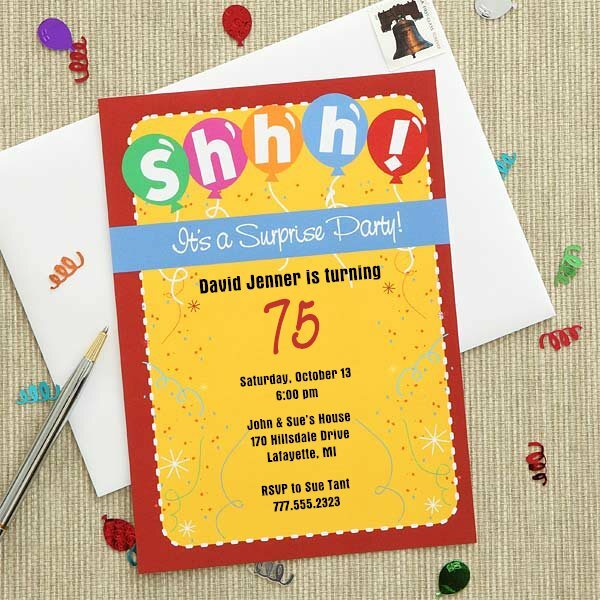 These cheerful yellow and red suprise party invitations are the perfect way to let everyone know not to spill the beans about the upcoming party! Personalize the heavy-weight cards (110 lb card stock) with all the pertinent details: Name, date, time and location of the party, RSVP information, and anything else you want to add. Sturdy white envelopes are included with your order; you can choose to have the return address pre-printed if you’d like. The 5″ x 7″ cards are sold in sets of 24; you can also purchase matching thank you cards. Fast turn around (you can have these in just 2 days with the express option) gives you more time to relax and enjoy planning the party!